Many of my optometrist/optometry school readers have likely already heard about the AOA backed Think About Your Eyes media campaign, and I am hoping that other readers have to -- either by seeing their ads on TV, magazines, or over the radio. With healthcare changes just beginning to take effect, more Americans than ever will have vision coverage, but vision isn't even the best reason to get an eye exam! The health of the eyes is so complex, and your eye doctor can find potentially blinding conditions years before they have time to cause permanent damage, as well as systemic health conditions like hypertension, cholesterol issues, and diabetes (just to name a few!). Unfortunately due to years of difficulties fighting for recognition with insurances and others even in the medical profession, optometrists have been rather hidden from patient access due to insurance panel black-balling (which is now illegal with great legislature like the Harkin Act) and the important health aspects of an eye exam have been widely unpublished. No more is this the case, and it is time for us to get behind the AOA's latest campaign to help bring the real benefit of optometry to the masses! 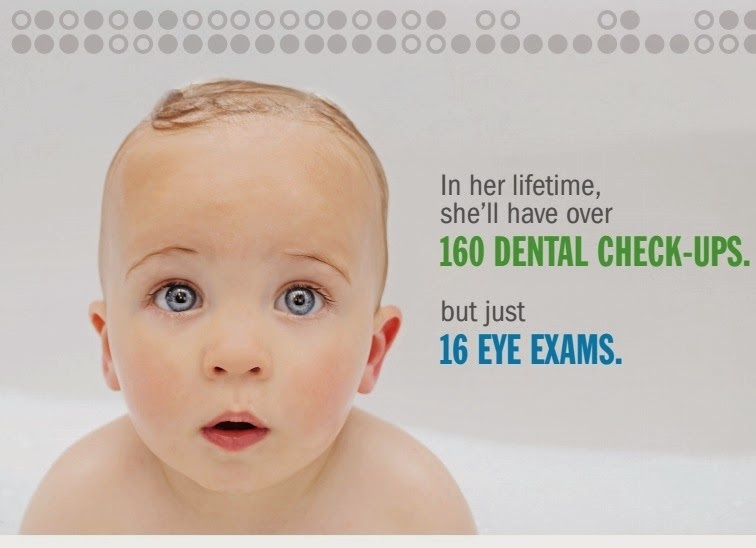 What Age Should My Child Have Their First Eye Exam? Infant's eyes are developing so quickly from birth -- going from seeing just blurry shapes to increasing clarity, depth perception, and the ability of the eye muscles to track and move together. That is a lot of skills developing at once, and no surprise that many issues can result if this development is slowed or stalled. As such I recommend taking advantage of a wonderful program called InfantSEE that provides a FREE eye exam for anyone under 1 year of age. I recommend having that first eye exam at around 6 months to ensure the eyes are developing equally, and check for blinding congenital conditions like tumors and childhood cataracts and glaucoma. Maybe your child is already older and has gone without an eye exam to this point. At worst, I recommend an exam before entering kindergarten to ensure your child is using their eyes equally. If your child only sees clearly out of one eye, they are immediately at an unfair disadvantage to their fellow classmates in learning how to read, write, and do math. Eye screenings at your primary care doctor are incapable of finding inequality between the eyes at the rates to which they exist because children hate getting things wrong and will typically memorize letters or take a sneak look with their better eye to "pass a test". Make sure that you are helping your child perform their absolute best by making sure they can use both eyes with a real eye exam! Should I have an eye exam if I have perfect vision? Yes! The vision component of your exam is just a small part, and the ability to see clearly is unfortunately no way to ensure that your eyes are healthy. Most health conditions of the eye, like glaucoma, macular degeneration, ocular tumors, and destruction of tissue due to hypertension or diabetes does not cause vision loss until the condition is advanced enough to be irreversible in most cases. If you wait to go to your doctor until you have vision loss, you will never be able to see clearly again! Yes, let that sink in because for many people that is a shocking fact. Your doctor is assessing your ocular health at every visit to find these issues years or decades before they can damage your ability to see, and that is why a yearly exam is essential to every single person. Remember, the retinal cells inside the eye are not fully visible without dilation or retinal photography, and these cells that allow us to see have no pain receptors so you want be able to feel any discomfort if you have a retinal disease! You won't have a red eye; you won't have watering. Ocular diseases cause painless, permanent vision loss! These ocular conditions are treatable, and there is no excuse in today's age of medicine that so many people go blind due to ocular disease. With regular check-ups early risk factors or diseases will be found and treated before hopefully any vision loss can occur. My eyes are red/itchy/watery/infected/have something stuck in them. Should I go to the ER (or urgent care clinic for that matter)? Well you most certainly can, but it is more expensive, more time consuming, and likely you won't be seen by anyone with specific eye training. If you have a problem with your eyes, please don't waste your time and money going to someone that is not an eye specialist unless it is truly an emergency (like you got stabbed in the eye with a knife for example). Your eye doctor has the proper training, equipment, and likely in-office samples to treat your condition quickly and accurately, without any long waits or excessive price to you out of pocket. Allergies? Pink eye? Dry eye? Foreign body sensation? Yes, I can help. And I can accept your medical insurance as well! Oh yes, and I can get you seeing as clearly as your eyes are capable of seeing too. Please America, optometrists love this career and love helping people, so let us help you.